Since ICD-10's go-live last October, providers seem to be faring well and experiencing minimal denials related to the new code set. This is certainly good news, especially for those who feared the worst. In fact, according to the Centers for Medicare & Medicaid Services (CMS), only 10% of the total claims processed during the fourth quarter of 2015 were denied. Some have referred to this lull as the quiet before the storm. 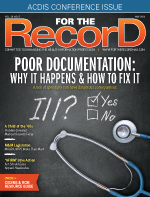 Other coding pundits identify it as a delayed reaction from payers as they ramp up coding expertise, productivity, and ICD-10 claims data analytics prior to unleashing an avalanche of coding denials later this year. Optimists believe this denial-free period will continue indefinitely. Realistically, it's probably only a matter of time until payers begin to scrutinize claims more closely. Based on the latest denials data and auditor insights, there appear to be eight specific areas where potential claims denials will occur in 2016. Since prevention continues to be the best medicine, specific coding remedies are available to keep these potential nightmares at bay. Some have speculated that payers are using this time to perform data analytics that will inform their auditing efforts. This makes sense considering payers will want to maximize auditing resources toward specific areas of vulnerability. When may this new wave of audits hit providers? October 1, if not before—particularly for acute care hospitals—seems to be a reasonable estimate. However, physician practices may not see significant denials until after October 1 when the grace period has officially concluded. Either way, all providers must start planning for—and mitigating—these denials now. It may take weeks or months to rebuild compliant processes. • Anemia associated with malignancy (D63.0). When the admission is for treatment of the anemia only, report the malignancy as the principal diagnosis. • Admission for palliative care (Z51.5). Per the instructional note, also code the condition requiring care. • Admission for rehabilitation. Per the guidelines, when the purpose for the admission/encounter is rehabilitation, list the condition for which the service is being performed as the principal diagnosis. If the condition for which the rehabilitation service is no longer present, report the appropriate aftercare code as the principal diagnosis. • COPD with a lower respiratory tract infection (J44.0). Per the instructional note, sequence the lower respiratory tract infection as secondary. • Pressure ulcer (L89) with gangrene (I96). Per the instructional note, first code any associated gangrene. Aftercare codes (Z42 to Z49, Z51) identify specific types of continuing care after the initial treatment of an injury or disease. Coders should not report these codes for aftercare of an injury. Instead, assign the acute injury code with the appropriate seventh character for subsequent encounter. Consider auditing claims with Z51.89 (encounter for other specified aftercare) to determine whether an acute injury code (with the appropriate seventh character) should have been more appropriate. • Initial encounter: Assign while the patient is receiving active treatment. Examples include surgical treatment, emergency department encounter, and evaluation and continuing (ongoing) treatment by the same or different physician. Note that the initial encounter is not limited to the first visit. • Subsequent encounter: Assign while the patient is in a healing or recovery phase. Examples include cast change or removal, X-ray to check healing status of a fracture, removal of external or internal fixation device, medication adjustment, and follow-up visits following fracture treatment. • Sequela: Assign for residual effects of an illness or injury. Examples include scar formation resulting from a burn, deviated septum due to a nasal fracture, and infertility due to tubal occlusion from old tuberculosis. When selecting the seventh character extension, review documentation carefully to ensure that the correct type of encounter is reflected in the ICD-10-CM code. Although ICD-10-CM includes some unspecified codes, payers will likely discourage and/or deny them in many instances. The big unknown at this point is what unspecified codes will be generally accepted and which will be generally denied. Because of the ICD-10 grace period, physician practices may struggle the most with unspecified codes. During this one-year period ending on October 1, 2016, CMS and the American Medical Association agreed to loosen Medicare compliance requirements for physicians. More specifically, during this period physicians can't be denied payment upon retrospective audit if the code they report is a valid code within the correct family of codes. Why might the grace period backfire on physicians? Many physicians incorrectly assume that the leniency absolves them of any and all responsibility to comply with ICD-10 specificity. Although this assumption may allow them to operate smoothly for a year, it will certainly be a rude awakening when the grace period ends. In other words, payers could potentially flip the switch on October 1 and start denying claims in large volumes. Codes that were accepted for a year may suddenly be denied. Physicians who have been reporting unspecified codes out of convenience may see bulk denials at this time. • Run frequency reports on unspecified codes. Do these codes tend to occur in the same category, specialty, or with the same physician? • Determine the documentation elements needed to assign more specific codes. • Create documentation templates to assist providers. • Provide physicians with specialty specific education. • Monitor, track, and trend results. Coders must be leery of assigning separate codes for left and right when a more specific bilateral code exists. For example, a patient presents with age-related nuclear cataracts in his or her left and right eyes. Don't assign H25.11 (right eye) and H25.12 (left eye). Instead, assign H25.13 (bilateral). ICD-10-PCS requires two codes for hip and knee replacements (one for the removal and another for the replacement) whereas ICD-9 required only one code. If a coder reports one code in ICD-10-PCS, it could raise a red flag to an auditor. For example, a patient undergoes an open left knee replacement using synthetic substitute. Report ICD-10-PCS code 0SPD0JZ (removal) and 0SRD0JZ (replacement). Interestingly, if a coder assigns only a code for the removal, the case maps to diagnosis-related group (DRG) 470. If he or she assigns both codes, it maps to lower-weighted DRG 468. For example, many codes in chapter 10 (diseases of the respiratory system) often require coders to assign an additional code for history of tobacco use (Z87.891), tobacco dependence (F17.-), or tobacco use (Z72.0). Codes in chapter 11 (diseases of the digestive system) often require coders to assign an additional code for alcohol use and dependence (F10.-) as well as any one of the tobacco-related codes listed previously. Medical necessity is tricky because so many local coverage determinations (LCDs) and national coverage determinations (NCDs) have been overhauled in light of ICD-10. Some providers are experiencing denials when all but one diagnosis code listed on the claim meets medical necessity requirements. Note that, as of this writing, some of these LCDs and NCDs are scheduled to be fully updated. Providers should monitor NCD updates and ensure that all submitted codes are deemed medical necessity. • Coordinate efforts between coding and clinical documentation improvement. Ensure that both groups meet regularly to compare notes and brainstorm solutions. • Focus on ongoing coder assessment and training. • Increase staffing during the second quarter and beyond when denials may increase. • Divide the denial workload based on staff knowledge and expertise. For example, assign certain denials and remark codes to individuals who specialize in those denials and who can work them more efficiently. As the adage goes, history tends to repeat itself. If mistakes were being made in ICD-9, those same mistakes—as well as new ones—are likely to appear in ICD-10. If the root causes of these denials are not targeted now, health care organizations face serious challenges, making it imperative to identify and address coding vulnerabilities before the auditors do. — Debi Primeau, MA, RHIA, FAHIMA, is president of Primeau Consulting Group.